With a sunny demeanor that belies his harrowing upbringing in Kazakhstan, and a fearsome capacity for destruction in the ring, middleweight champion Gennady Golovkin is poised to become boxing's next superstar. This story originally appeared in the October 19, 2015, issue of Sports Illustrated. To subscribe to the magazine click here. This story was also published prior to Golovkin's defeat of David Lemieux at Madison Square Garden on Oct. 17. "See that spot?" Gennady Golovkin points to a patch of sun-splashed asphalt at the edge of the driveway. "That's the best spot here." It's a brisk September morning in Big Bear, Calif., where the balmy Southern California clime waiting some 30 miles down the mountain seems half a world away. Here, at Abel Sanchez's gym, 7,000 feet above sea level, a sliver of sun escaping the shadows of the towering pines that surround the building is prime real estate. The sun. Golovkin loves it. Lots of athletes take pride in their physiques; Golovkin glows over the near flawless tan on his lean 5' 11", 160-pound frame. Last year he relocated his family from Germany to Santa Monica. In Big Bear, Golovkin has a spot on the second-floor deck, where every morning the sun hits a perfectly positioned recliner. It's not uncommon for Sanchez to arrive at the gym and see Golovkin stretched out, arms behind his head, a broad smile on his face. It's cute, as if Mike Tyson had a thing for manicures. Tyson? Any comparison to the fighter once known as the baddest man on the planet is sacrilege in some corners. Still, Golovkin, the 33-year-old WBA middleweight champion, who will face IBF titleholder David Lemieux on Saturday night at Madison Square Garden, is a bona fide boxing badass, 33--0, with 30 knockouts. He has the highest KO percentage (91%) in middleweight championship history. He's blessed with power in both hands and the kind of pinpoint accuracy that amplifies the pain. His opponents will attest to it; it has been seven years since one has finished a fight. Sparring partners, too. Golovkin doesn't try to hurt his partners; Sanchez—Golovkin's trainer since 2010—notes that the fighter aims for the arms and shoulders when throwing his biggest punches and that all of Golovkin's sparring partners wear extra padding around the rib cage. The champion treats sparring like practice—just as long as his partners do too. In '11, Golovkin was in Hollywood, looking for sparring at Freddie Roach's Wild Card gym. Peter Quillin, then a rising middleweight contender, was available. According to Sanchez, Quillin "got a little cute" with Golovkin in the first round. In the third Golovkin tagged Quillin with a shot that opened up a cut under Quillin's left eye. Sparring session over. ​In 2012, Sanchez got a call from Clemente Medina, trainer for 154-pound brawler Alfredo (Perro) Angulo. Medina asked Sanchez if he had any sparring. Sanchez said he had Golovkin and asked how many rounds he wanted to go. Angulo goes 10 every day, Medina replied. Sanchez invited him up to Big Bear. On Monday, Angulo went six rounds; on Wednesday, five. On Friday, sparring had to be stopped in the fifth after Golovkin smashed in Angulo's nose through his face guard. Two days later Sanchez asked Medina if he was coming back. "F--- you," Medina said. "That Russian is going to kill my Perro." That Russian—Kazakh, to be accurate—has drawn similar reactions from many others. Promoter Lou DiBella, after watching Golovkin stop Matthew Macklin with a rib-splintering body shot in 2013, called Golovkin an animal. Gary Shaw, whose fighter, former champion Daniel Geale, couldn't get out of the third round with Golovkin, declared Golovkin the best middleweight he had ever seen. When advised that Curtis Stevens, a recent Golovkin knockout victim, claimed Golovkin didn't have one-punch power, Derrick Findley, a frequent sparring partner, said, "Curtis is full of s---. That's the hardest puncher I've ever been in with." GGG, Triple G, Big Drama Show—whatever you want to call him, Golovkin is an iron-chinned, stone-handed force who in the wake of Floyd Mayweather's retirement has become arguably the best pound-for-pound fighter in the world. The only question is why, at his relatively advanced age, is the world just noticing him? The two men slid onto one side of a picnic table, and if you didn't know they were twins, or even related, you never would have guessed. One, Gennady, long, chiseled with a boyish mop of hair and a similarly innocent smile. The other, Max, shorter, thicker, with a shaved head and hard, steely eyes. Both experienced the worst of life in a former Soviet Republic; the poverty, the violence the relentless loss. In 1990 the eldest Golovkin brother, Vadim, a soldier in the Soviet army, was killed in action. A few years later another brother, Sergey, died, under circumstances neither brother cares to talk about. Both feel the pain of an unforgiving childhood. One smiles through it. The other seems to carry it, like a weight lashed to his soul. Golovkin was born in Karaganda, a coal-mining town in the rugged mountains of central Kazakhstan. His father, Gennady Sr., was a miner; his mother, Elizabeth, a technician at a chemical lab. The family crammed into a modest home in Maykuduk, one of the city's most dangerous neighborhoods. "Think the worst part of Detroit," says Sanchez. There, fighting was a way of life. Says Gennady, "The older kids, if they wanted something from you, whether it was cash or sports equipment, they would just take it. My older brothers used to say, 'If someone tries to take something from you, never give it to them.' So we fought all the time." Sports became an escape. Not just boxing; Gennady excelled at soccer and basketball too. But the boy who beat back bullies with his fists eventually gravitated toward fighting with gloves. With Max, Gennady started training at a nearby fitness center. Quickly, both brothers separated themselves from the rest of the group. "I don't know when it happened, but we both started to get really good," says Max. "The more we went, the better we got." Gennady rose rapidly through the amateur ranks, winning a gold medal at the junior world championships in 2000; a gold in the world championships in '03 followed; in '04, Gennady, captaining the Kazakh national team, took home a silver medal from the Olympics in Athens. America will watch Gennady Golovkin, but will they pay to watch him? ​Golovkin smiles when recalling his amateur days. Most of them. In 2005, Golovkin again entered the world championships. One more run with Kazakhstan, Golovkin figured, then turn pro. In the preliminary rounds Golovkin faced Mohamed Hikal of Egypt. He dropped Hikal three times and appeared headed for another easy victory ... until the judges declared Hikal the winner. The building erupted. Coaches sitting ringside looked at each other quizzically, stunned by the result. Fighters from other countries rushed to Golovkin's dressing room to tell him he'd been robbed. To Golovkin, the explanation was simple. "At that championship," he says, "there were a lot of people who won who should not have. It was just wrong." Something else bothered Golovkin. Absent from the stream of supporters flowing through his dressing room were representatives from the Kazakh team. No coaches. No officials. "Nobody from my team tried to defend me," Golovkin says. Representatives from Universum, a German-based promoter with whom Golovkin had been negotiating for months, were. They handed him a contract. Golovkin signed it. He went to see his teammates. I'm going pro. Thanks for everything. Goodbye. In 2005, Universum was a promotional powerhouse. Its stable included world champions Felix Sturm, Sebastian Zbik and Jürgen Brähmer. It had a lucrative television deal with German network ZDF. Golovkin had high expectations. Early on, they were met. He made good money. He fought on high-profile undercards. He rose steadily in the middleweight rankings. But around '08, things changed. Golovkin was closing in on a mandatory shot at 160-pound champion Kelly Pavlik of the U.S. Golovkin begged Universum to push for the fight, which almost certainly would have taken place in the States. The promoters declined, citing a desire to continue building his profile in Europe. Golovkin asked for a fight with Sturm, then one of the biggest stars in Germany. Universum again passed. "They were more interested in building Sturm than me," says Golovkin. "From then on I didn't want to be one of the German stars; I wanted to beat all of them." "Give me three years," Sanchez told Golovkin when he began training him, in 2011, "and your name will be right there behind Ali." In 2010, Golovkin sued to get out of his Universum contract. The company fought it, dragging litigation out for nearly two years. In '11, Golovkin became a promotional free agent. He made himself a promise: From then on, he would control his own future. A phone buzzed in Abel Sanchez's pocket, interrupting the late breakfast of a semiretired trainer. In 2011, Sanchez was all but out of boxing. Terry Norris, his prized pupil, a Hall of Fame fighter, was long since retired. In '01, Sanchez, then working with Francois Botha, a heavyweight, and Miguel Angel Gonzalez, a lightweight, became frustrated with their lack of work ethic. So he quit. He built a vacation home in Big Bear and threw himself into his contracting business. In '07 he put the house on the market. While waiting for a buyer, he converted the garage into a gym. When word spread of a high-altitude facility, trainers approached him about using it. Sanchez picked up a fighter or two, but never thought seriously about getting back into the sport. The call that day was from manager Oleg Hermann. He had a fighter, Gennady Golovkin, who was shopping for a new trainer; would Sanchez be interested in meeting with him? "My first reaction," says Sanchez, "was, Who?" A few days later Golovkin was in Big Bear. On a pair of training tables the two men watched DVDs of Golovkin's fights. 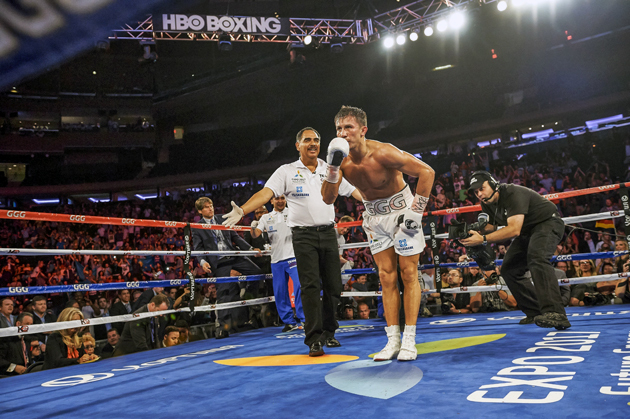 Sanchez would pop up, hit pause and critique what he was seeing; Golovkin absorbed it all. Watching Golovkin, seeing the natural skill on film and hearing, through broken English, how his mind worked sparked something in Sanchez. "He had a radar," says Sanchez. "He saw everything coming at him." The next morning Golovkin thanked Sanchez—and told him he would see him in two months. Sanchez didn't believe him. He knew Golovkin had been making the rounds. He was just one stop. Two months later his phone rang again. It was Max Hermann, Oleg's brother. Gennady will be at the airport tomorrow, Max said. Can you pick him up? Sanchez refuses to take credit for Golovkin's success. "Ray Charles could train him," he says. 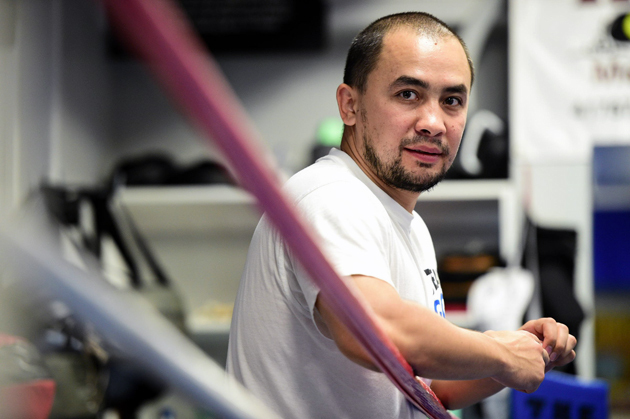 The trainer felt a rare power from Golovkin when working the mitts; in sparring, he watched a unique mind at work. A month in, Sanchez called Golovkin into a room. On a whiteboard Sanchez scribbled a list of the greatest fighters in boxing history. He put Muhammad Ali at the top. He left No. 2 blank. Names like Floyd Mayweather, Sugar Ray Robinson and Mike Tyson followed. "I said, 'Give me three years,'" says Sanchez, "and your name will be right there behind Ali." ​A few tweaks were needed. As an amateur, Golovkin had been conditioned to punch primarily to score points. A "calm puncher," as Sanchez put it. In the U.S., the path to success is through exposure on HBO or Showtime, and neither network was interested in an Eastern European fighter who won by decision. Power took on added importance. That meant conditioning Golovkin to redistribute his weight from his back foot to his front. That meant regular weight training. That meant film study. "He was like a duck to water," says Sanchez. "Never complained. Did everything I asked." Sanchez wanted Golovkin to become a predator. A power puncher's ability to cut the ring off is an essential skill. Sanchez showed Golovkin video of cutting horses separating sheep from a pack. He pointed out how the horses anticipate the sheep's movement and get to a spot before they do; Golovkin needed to do the same thing with his opponents in the ring. 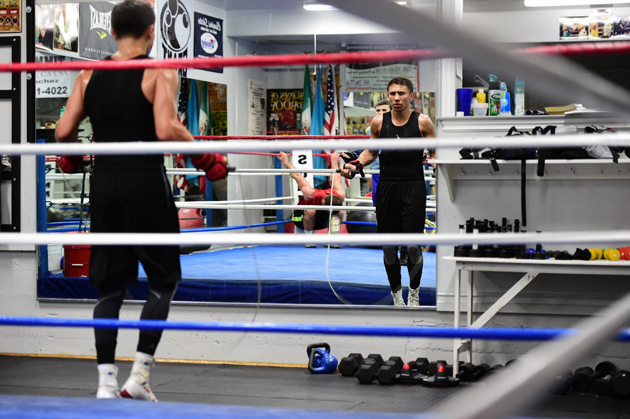 Sanchez pushed Golovkin to expand his range. Most fighters target areas from the bridge of the nose to just below the rib cage; Sanchez encouraged Golovkin to aim anywhere from top of the forehead to just above the belt line. Many fighters slide side to side to avoid punches; under Sanchez, Golovkin learned to lean back, putting himself in position to counter punch with power when an opponent misses. "He's not running from any punches," says Stevens. "If he makes you miss, he's always within arm's reach to make you pay." Fighting this way carries a price; to deliver big hits means being willing to absorb a few too. "I knew this," says Golovkin. "But to succeed in [the] U.S., I had to go for knockouts." He had to fight through adversity as well. In 2013, Golovkin was scheduled to defend his title against Gabriel Rosado. It was Golovkin's second fight on HBO and his first at Madison Square Garden. Two days before the fight Golovkin summoned his manager to his room at 3 a.m. The flu had hit him. His throat was closed. He could barely breathe. Golovkin's team told him he had to cancel the fight. Golovkin begged them to wait. On Saturday morning he told them he felt better. "No way was he 100%," says Sanchez. Whatever. Golovkin stopped Rosado in the seventh round. "He understands that he has to make a statement every time he fights," says Sanchez. "A lot of fighters who have had the success Gennady has had wouldn't accept that. He's just a different breed." By now, Manny Pacquiao's story is part of boxing lore. In 2001 the skinny Filipino wandered into Wild Card, a raw bundle of speed and power that Roach would mold into one of the best fighters of this generation. But what made Pacquiao a star was who he beat. Between 2008 and '10 he picked up wins over Juan Manuel Marquez, Oscar De La Hoya, Ricky Hatton and Miguel Cotto, victories that elevated him from just another world champion to a box office attraction. Golovkin is looking to follow a similar path. His promoter, Tom Loeffler, has purposely built Golovkin in major media markets New York and Los Angeles; Golovkin's last fight drew more than 12,000 to The Forum in L.A.; close to 20,000 are expected to fill Madison Square Garden on Saturday night. His HBO ratings continue to soar—Golovkin fights average well over one million viewers—and, against Lemieux, Golovkin will make his first appearance on pay-per-view. The hope is that a strong showing (150,000 buys is considered good; anything over 200,000 is a smash) will generate the financial incentive needed to entice the biggest names in the division (Miguel Cotto and Saul Alvarez, specifically) into the ring. Says Loeffler, "[Saturday] is paramount for his career." It's a fact not lost on Golovkin. Titles. Exposure. A chance to test his skills against the best. For so long, this was all he wanted. As he shuffles in and out of the flickering sun, an onlooker suggests this fight will be his biggest yet. "I hope so," Golovkin says. Then he's gone, back to the gym, back to work. The journey from the Kazakh streets to amateur glory, from anonymous world champion to burgeoning U.S. star has been a long one. But it's not over yet.